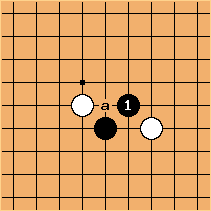 Hebo-kosumi ( here), a Japanese term meaning "weak player's diagonal" or "duffer's diagonal", refers to an ineffective diagonal move, where a push (a) or jump would be better. Of course a diagonal move is connected, but it can turn into an empty triangle, be the target of an atekomi, end up in shortage of liberties, move out too slowly, or simply lack punch. Like other so-called bad shapes, including empty triangle, however, the hebo-kosumi can be the strongest move depending on the situation and may be found even in pro games. An article in Go World explained that one aspect of Kobayashi Koichi's strength was that he didn't dismiss without thinking a 'duffer's diagonal'. Note that a diagonal attachment can often be a poor move, but is not referred to as hebo-kosumi.